With the world's biggest bike race starting in Leeds on 5 July, BBC Yorkshire's Tour de France correspondent Matt Slater rounds up the best of the gossip, opinion and stories, on and off the bike, and also tries to explain some of cycling's unique lingo. Legacy alert One of the most common questions I get from you, the licence-fee payer, is: "Will the Tour de France be more than just a flash of carbon fibre and wickable fabric for Yorkshire's economy?" I probably get that almost as much as: "Tour de France correspondent? Are you having a laugh?" My answer to both is "yes", but to the former I add: "Why wait until after the Grand Depart, it's happening now." And to prove that I write to you now from a family break in The Dales: the Tour effect in bed-and-breakfast form. The flipside of that, however, is that this is going to be an abridged diary. Bolton Abbey's welly walk waits for no man. This weekend's top tale came at Leeds First Direct Arena where 5,000 Tour Makers gathered for a motivational rally, as if one was needed. The Tour Makers are the Olympic-style volunteers who will point riders/spectators/visiting dignitaries in the right direction, answer questions and remain cheerful at all times over the Grand Depart weekend. Leeds boxing star Nicola Adams and Yorkshire cycling great Brian Robinson spoke at the gathering, and Alistair Griffin performed his official Tour anthem, The Road. A good gig that for Alistair - Prince had played on that very same stage the previous evening. Lost in Leyburn If I have heard it once I have heard it a thousand times: Le Tour is going to put Yorkshire's hidden treasures and secret spaces back on the map… and not a moment too soon for the likes of Mark Cavendish, apparently. The Manx Missile was up in The Dales last week checking out the Tour route. But his sat nav went a bit wobbly on the road to Middleham, forcing him to stop at a bus shelter in Leyburn. Thankfully, youngsters in The Dales do not need GPS devices to know where they are going, and two schoolboys soon set the star sprinter on the right path. Royal send-off There was an interesting exclusive in The Express over the weekend, as it reminded me of the "operational note" every media outlet had been sent a few days earlier. No matter, the key point is that the Duke and Duchess of Cambridge will be at Harewood House to wave off the 22 teams as they roll past the Queen's cousin's front door. This visit has some particular significance for the royal family, apparently, but it "will be far from most competitors' thoughts as they adjust their cycle clips for the start of the 101st Tour". I think that is a safe prediction. No room at the inn Looking for a hotel room in York for the Grand Depart? Don't bother, they're full. Have you been watching the Giro d'Italia? Oh dear, if not, you have missed some spectacular racing. No time to give you all the details now, suffice it to say that all is still to play for with a week to go. Colombia's Rigoberto Uran still has a pretty healthy lead, but he has lost small chunks of time in recent days to the men most likely to give him the biggest challenge in the coming days, men like compatriot Nairo Quintana and Italian Fabio Aru. Elsewhere, it has been a case of new wounds and old ones. American star Taylor Phinney has broken his leg in two places after a bad crash at the US Nationals, while Chris Froome has decided to pick at the scab of his "relationship" with Sir Bradley Wiggins in a newspaper serialisation of his autobiography. With the Tour hurtling towards us, the timing of both of these events is pretty dreadful. Off the back/front - After my struggle to find a good "N", I am still in the mid-alphabet doldrums of cycling's lexicon here. The best I can offer is a couple of staples from commentary. Riders are either "off" the back or front of the pack. Being off the back means you are being left behind. This is bad. Being off the front means you are surging ahead. This could be good because it suggests you are feeling strong and fancy your chances of a breakaway win. Or it is bad because you are bluffing/confused as to how much further there is to go. With time short and WiFi patchy, I am going to rely on Mark Cavendish's remarkable record to provide a nugget of cycling knowledge. The 2011 Sports Personality of the Year has now won 25 Tour stages during his career, which is good enough for third on the all-time list behind Bernard Hinault's 28 and Eddy Merckx's 34. 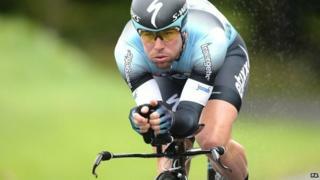 Cavendish's best year was 2009 when he won six, which he followed with consecutive hauls of five in 2010 and 2011. The last two races have not been quite so productive, though, as he has lacked the full-bore support of his team and faced a lot more competition from others. How he gets on at this year's race will go a long way to answering the question of whether he will overhaul Merckx's total.